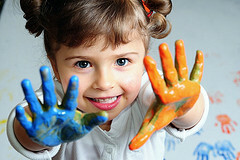 Allowing a child to participate in art is a fun way to let them explore the development of their creativity. "Art" can encompass a variety of different things. 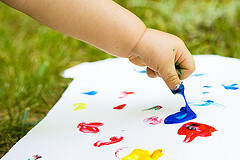 Whether the project be an outdoor mud pie, or a writing utensil on a blank sheet of paper, a child is able to create a unique masterpiece - something of which they can be proud. Let children get involved and be creative whenever the opportunities arise.